Inflammation is our body’s natural way of repairing damage. Inflammation brings in many natural body chemicals to help heal an injured area. Inflammation is a major way the immune system will respond to immune burdens. So does this mean inflammation is our friend or our foe? Well it depends. If this inflammation continues too long we end up in an inflammatory cascade which leads to a host of problems. 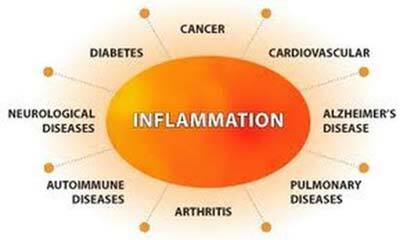 Chronic inflammation is a major factor in most degenerative disease, like heart disease. Chronic inflammation creates a situation where the body is unable to repair itself…a cumulative repair deficit. Inflammation then causes a flight or fight defense physiology, like we are running away from a lion. This in turn causes cell hormones to drive up your adrenals, which fatigues your adrenals (a major source of energy and stamina). This increases our cortisol, which can lead to more of a “spare tire” around our hips. The biggest thing we can do to reduce your total body inflammation is to eliminate our core food allergens/intolerances? Your core food allergen/intolerance complicates the healing process by increasing the overall body inflammation. Once you remove the core food allergen your body’s inflammation will reduce, and sensitivities to other foods will decrease as well. You will feel better and have less inflammation, and more energy and vitality. Your body will be more prepared for a true injury or immune response. You will be healthier! Figuring out what your food intolerance / allergy is, can be done easily at home with a food allergy elimination test. Give our office a call to find out more about food allergy testing. If you have any of the above responses then you are most likely intolerant or allergic to the food you tested. Remove it from your diet and move one huge step closer to being fully alive and healthy!